Clayton Patterson with Elsa Rensaa. In every aspect of Clayton Patterson's work, Elsa Rensaa has played a significant role. She was his editor on his first video work of shows at Pyramid Club and CBGB; assisted the creation of the underground Tattoo Society of New York; designed and printed the invites and posters for the NYC International Tattoo Convention once tattooing became legal (due to Clayton and Elsa’s political push); and hand-stitched the embroidery on Clayton’s Hats, a direct reflection of their intimate working relationship. But to say that Elsa Rensaa is Clayton Patterson’s muse is an understatement. 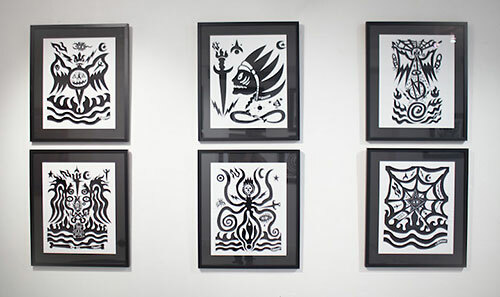 Galerie ABP is honored to be the first gallery to showcase Elsa Rensaa’s original artwork. Her work is painted with the skill of Michelangelo yet laced with the unparalleled attitude of a real deal New Yorker privy to what it is to stomp its mean streets everyday. Clayton's influence on the Lower East Side reaches further than the corners of Essex and Houston or Ludlow and Stanton; his photographs, paintings and writings document cultural and economic changes of all of New York City, and, one can argue, the entire world. He is one of the last ones standing of an era that gave birth to Keith Haring and Jean-Michel Basquiat, Madonna and Blondie. From an era where an unknown artist could live in a loft in Soho or in Tribeca off income from selling prints in the street. An era that is long gone. 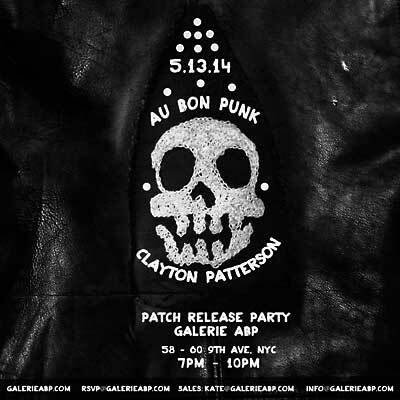 This is why the location for The $16 Burger Show at Galerie ABP is so fitting. The Meatpacking District, or as Clayton calls it: Dead Meat District, is ground zero for the transformation of Downtown Manhattan. Located in an empty retail space that used to house an overpriced burger restaurant, Galerie ABP is surrounded by two of the world’s biggest corporations: Google and Apple. It is a few blocks down from Chelsea and the dozens of galleries that form the pulse of the global art commerce. A full circle of sorts will take place with The $16 Burger Show. A celebration of two of the most important figures of Lower Manhattan culture in the last three decades. The pop up gallery, opening for a month on April 15th, will foreground never before seen works dug up from deep inside Clayton and Elsa’s museum-like house on Essex street, a selection of the artist's eponymous Clayton Hats, and an array of new works. This show is a rare peek into the life of a New York City legend who has quietly maintained an immense amount of creative output throughout the past three decades, much of which has been crafted in partnership with his wife. Screenings of films relevant to Clayton's prolific career, Captured and 10 Men Talking, are scheduled throughout the month. Last night was one for the books as the LES’ very own documentary photographer Clayton Patterson celebrated his farewell exhibition with life partner Elsa Rensaa at the Galerie ABP (Au Bon Punk) on 58-60 9th Ave. Plenty of us stood in the rain as we waited in anticipation to go inside and warm up with the welcoming vibes of arts and culture. Clayton's influence on the Lower East Side reaches further than the corners of Essex and Houston or Ludlow and Stanton; his photographs, paintings, and writings document cultural and economic changes of all of New York City, and, one can argue, the entire world. He’s one of the last ones standing from an era that gave birth to Keith Haring, Jean-Michel Basquiat, Madonna, and Blondie. From an era where an unknown artist could live in a loft in SoHo or in Tribeca off income from selling prints in the street. An era that is long gone. 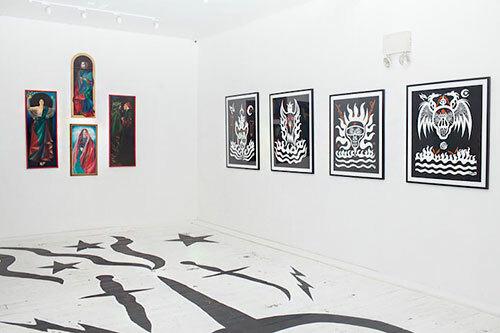 Clayton Patterson, the celebrated artist, photographer, videographer, historian and underground legend has managed to – through his works; photographs, artwork, and writings document much of the Lower East Side’s transformation over the past thirty years. Following his arrival in New York City during the late 1970s, he found himself fully immersed in the artistic, cultural, economic and political happenings of LES, but after years of witnessing firsthand the recent cultural decline of his beloved neighborhood as a result of big business, Patterson and his life-partner and collaborator, Elsa Rensaa are preparing to leave the New York City for good. 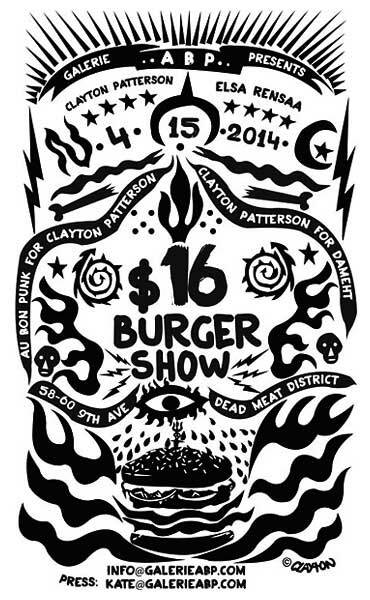 Before they do go, Patterson and Rensaa are unveiling their latest project, The $16 Burger Show: Clayton Patterson with Elsa Rensaa exhibit. 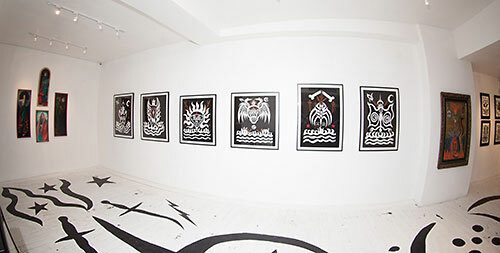 Culminating May 14, the exhibition is located in NYC’s Meat Packing District or, as Patterson would rather it be called: the “Dead Meat District” and features a collection of never-before-seen artwork by the Canadian-born artist and photographer, including several of his ink-on-paper prints. There will, of course, be photographs from his extensive archive on display, along with artwork from Rensaa as well. Interestingly enough, the space hosting The $16 Burger Show was once home to an overpriced burger joint. ■ Brixsable: I did not like these paintings, too aggressive and dark. 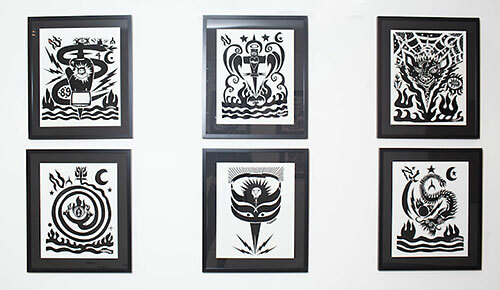 ■ Charlotte Allen: These prints are amazing!! I got a chance to see Mr. Patterson's video "Captured" I was in awe. He and Elsa are walking vaults of history for the Lower East Side starting back in the late 70's. They both had ambition and determination, Elsa was that infinite "Ride or Die Chick". Watching the video has definitely inspired me and sparked a flame under me.